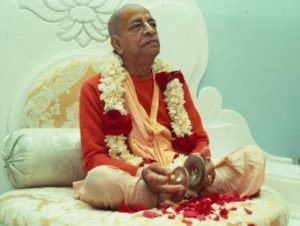 Never make the mistake of thinking that Srila Prabhupada is like us, and is somehow influenced by the modes of nature. He lives with Krsna always, but to teach fools like me, he has kindly come down to the second level devotee stage simple to be able to preach for Krsna. So we need to guard against forgetting this and thinking that Prabhupada is being influenced by material nature like us. We can never dare to minimize our founding Acarya and consider him an ordinary man. We will simply go to hell. Our beloved Srila Prabhupada is the spotless and perfectly unalloyed devotee of Krsna. The vaishnava guru is described in all the revealed scriptures as the external manifestation of Supersoul. All the instructions we have received from him are non-different from Krsna’s instructions, which the bone fide guru is simply passing along. Krsna’s instructions are in all ways identical to Krsna Himself, because of the absolute nature of the Supreme Personality. On the absolute level, guru and Krsna are the same since guru’s instructions are identical to Krsna’s instructions, which are identical to Krsna. So all three, guru, Krsna, and the path of Krsna consciousness are all perfect and transcendental. We can not forget that for a moment and start thinking that Srila Prabhupada or any sampradāyik vaishnava guru is like an ordinary man, in even the slightest way. He is the transcendental cent percent unalloyed emmisary of Krsna here in the material world speaking on His behalf. Srila Prabhupada hears the transcendental message from his pure devotee guru in disciplic succession, he becomes filled with Krsna’s message. When he speaks to us this same message, Krsna speaks through him, and we can be filled with Krsna also.